©2013 Museum Tinguely, Basel, Kehrer Verlag Heidelberg Berlin, authors [and translators], artists, and photographers. On June 27, 1960, responding to a request dated June 26, 1959, the French Ministry of Industry patented, under patent no. 1.237.934, an invention by “M. Jean Tinguely, résidant en Suisse” that was described as an “appareil à dessiner et à peindre.” Following the adjustment of a few parameters and the supply of mechanized energy, the fully automatic machine was to be used, among other things, the patent said, “pour la réalisation de dessins ou peintures abstraits … susceptibles d’être exposés et conservés.”(2) An art machine, therefore, was here patented, and this on behalf of a sculptor who had close ties with the Parisian avant-garde of the time, with artists such as Yves Klein, Jesús Rafael Soto, and Per Olof Ultvedt. Tinguely’s drawing machines caused a major stir. At the 1ère Manifestation Biennale et Internationale des Jeunes Artistes, opened on October 2, 1959, by the French Culture Minister at the time, André Malraux, Méta-Matic No. 17, a large drawing machine driven by a petroleum engine,(3) was removed from the premises of the Musée d’Art moderne de la Ville de Paris after pressure from other exhibiting artists. (4) Set up outside the museum, it soon became the biennale’s main attraction. The machine, which—independently of human initiative—was able to produce art in conveyor-belt fashion and then—by means of a built-in fan—also distribute it, was a sensation. And, at the same time, it permitted a new ‘sensation’ of modern, abstract art: in a manner never seen before, art, this apex of genuinely human creative power, was manufactured by a fully automated machine. Malraux commended it, the comic actor Danny Kaye had himself photographed with it, and the general public loved it. From the moment Tinguely first presented his drawing machines, in the exhibition Les Méta-Matics de Tinguely: les sculptures qui peignent at Galerie Iris Clert in Paris in July 1959, he enjoyed major success with them. (5) The art world was particularly fascinated with the possibility, indeed the necessity, of human interaction with Tinguely’s works. The opportunity to create an artwork oneself was not passed up by many people, and the exhibition at Iris Clert’s gallery drew enormous crowds. Many artists, including Hans Arp, Tristan Tzara, Man Ray, and Roberto Matta, attended and were thrilled; Marcel Duchamp in particular, who was Tinguely’s most important artistic father-figure, is said to have reacted enthusiastically. Laudatory and disapproving critiques were to be read in the press, and the dawn of a new era in art—and the end of painting—were both invoked: the revolt was complete. The notion of having machines produce art was not new. Writing or drawing automatons in the form of human-like figures had already enthralled the public in the 18th and 19th centuries. (6) In the case of Tinguely’s drawing machines, though, two conditions were changed: first, it was now obviously machines that were producing the art — the automatons had cast off human form. Second, the machines were producing pictures that were plainly similar to those of the avant-garde of the time. The artists of Tachisme, the abstract style that dominated Paris in the 1950s and 1960s, saw their own works in the mechanical drawings. Not entirely without justification, therefore, painters like Hans Hartung and Georges Mathieu felt themselves mimicked by the Méta-Matics—and probably slightly under attack. Surrealist peinture automatique was over, and they had survived numerous attacks against non-objective art in general and abstract/expressive art in particular. Tinguely’s drawing machines had the look of a prototypical digest of the debates surrounding contemporary art. And, at the same time, they were part of the very context of the works and artists they ostensibly criticized. The drawing machines that Tinguely created in the years 1959 and 1960(7) are mostly freestanding, three-dimensional sculptures. Tinguely’s catalogue raisonné lists sixteen Méta-Matics, of which fifteen were created in 1959 or at the turn of the year 1959/1960, and one—the small portable Méta-Matic No. 15—evidently in 1961. (8) The outer form and function of these mechanical sculptures is relatively standardized. Via V-belts, a drive wheel turns one of a number of wheels which then set an eccentrically attached arm in irregular motion. Visitors are asked to clamp a pen onto the end of this arm, put a piece of paper in place, and then press the start button. The arm irregularly up and down, usually very quickly, leaving lines, scrawls or dots on the paper. Color change is possible, and the intensity of the color application can be influenced through a longer or shorter operating time, and through more or less intensive contact between pen and paper. Thus a drawing is created which is, on the one hand, the result of an artistic action—and this perhaps makes it a souvenir of an experience—and, on the other hand, the joint product of three ‘artists’: Jean Tinguely, the creator of the drawing mechanical sculpture; the mechanical sculpture itself; and, finally, the operator, who in this context is made a user and, indeed, a creator of art. If one component of this trio is missing, the whole is missing. 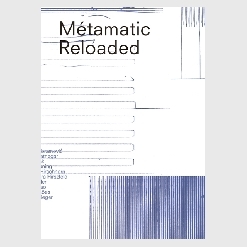 (1) This text is a heavily revised version of the essay “Méta-Matics. Zeichenmaschinen,” published in 1996 in the catalogue Museum Jean Tinguely Basel, Eröffnungsausstellung 1996–1997, Bern 1996, pp. 40–47. (2) “…for creating drawings and abstract paintings … capable of being exhibited or preserved.” Further named purposes are as toys, or for the decoration of strips of paper or fabric, see Pontus Hulten, Jean Tinguely – “Méta,” London 1975, p. 84. (3) Méta-Matic No. 17 is approx. 330 cm high; it now stands at the Moderna Museet in Stockholm. (4) See Miranda Fuchs, “‘Art is Revolt’ – Jean Tinguely as a Performance Artist”, in Museum Tinguely Basel. The Collection, Heidelberg 2012, pp. 210–243. (5) This exhibition took place at Galerie Iris Clert, 3 rue des Beaux-Arts, July 1–30, 1959. Jean Tinguely showed the Méta-Matics once again in October the same year at London’s Kaplan Gallery (Tinguely) and, in January 1960, in New York at the Staempfli Gallery (Jean Tinguely: Kinetic constructions and drawing machines). This exhibition marks the completion of the artist’s first creative period and simultaneously the opening of the next, which began with the action Homage to New York at the Museum of Modern Art in New York in 1960. (6) Of particular note in this context are the mid-18th-century automatons of the Swiss watchmaker Pierre Jaquet-Droz (1721–1790), which marked the highpoint of this artistic form. The three figures for which he is well-known, the Writer, Draftsman, and Musician, can now be found at the Musée d’Art et d’Histoire in Neuchâtel. (7) Tinguely had already shown a drawing machine at the exhibition Le Mouvement at Galerie Denise René in Paris in April 1955. This machine, fixed to the wall in the form of a relief, produced abstract painting on round sheets of paper. The (probably) three machines that were created in a similar manner at the time look like the first attempts or prototypes of the Méta-Matics he created in 1959/1960. In addition to drawings, the ‘robots,’ as the press described them, also generated sounds described as ‘concrete music’ and were, therefore, genuine total artwork machines. During this period, Tinguely dealt intensively with the sounds his structures generated. The Relief méta-mécanique sonore noir et blanc (1955) his Relief méta-mécanique sonore II (1955), the artist’s first explicitly music-producing works, were later followed by Mes étoiles – Concert pour sept peintures (1958) and the Méta-Harmonien of the 1970s and 1980s. (8) The Méta-Matics proven to exist are: number 1 (Musée National d’Art Moderne, Centre Georges Pompidou, Paris), 5 (formerly Buren collection, Stockholm, now private collection), 6 (Museum Tinguely, Basel), 7 (formerly Lauffs Collection, now private collection), 8 (Méta-Moritz, Moderna Museet, Stockholm), 9 (Scorpion, Museum of Fine Arts, Houston), 10 (Stedelijk Museum, Amsterdam), 10 (listed in the Bichofberger catalogue raisonné as number 13, Museum Tinguely, Basel), 10 (replica, 1990, Museum Tinguely, Basel), 11 (private collection), 12 (Le Grand Charles, private collection), 14 (portable, Museum Tinguely, Basel), 15 (1961, portable, Tinguely Estate, now private collection), 17 (petroleum-driven, Moderna Museet, Stockholm), 20 (Tinguely Estate, now private collection), as well as an unnumbered one from 1959/1960 (with stamp, private collection). Méta-Matic No. 18, which was first deployed on November 12, 1959, during the action Art, Machines and Motion at the Institute of Contemporary Arts in London, was destroyed.